"Cooking peeled potatoes in the pan around the roast is yummy. The only other things you need are gravy made from the pan drippings and a fresh vegetable." Cut slits in the top of the leg of lamb every 3 to 4 inches, deep enough to push slices of garlic down into the meat. Salt and pepper generously all over the top of lamb, place several sprigs of fresh rosemary under and on top of the lamb. Place lamb on roasting pan. 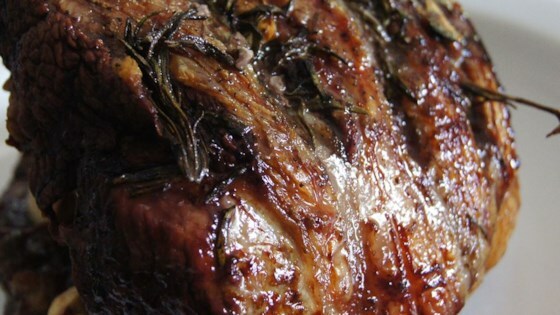 Roast in preheated oven until the lamb is cooked to your desired doneness, about 1 3/4 to 2 hours. Do not overcook the lamb, the flavor is best if meat is still slightly pink. Let rest at least 10 minutes before carving. For medium-rare to medium doneness, an instant-read thermometer inserted into the center should read at least 135 degrees F (57 degrees C). The meat will continue to cook slightly after it is removed from the oven. Didn't turn out like I thought it would but it could just be that I stink at cooking meat. Will try again. Wonderful, simple and simply delicious. The fat on the lamb gets so yummy and crispy that it's hard not to resist nibbling on it. The drippings make a fantastic gravy too. Great Mikell!